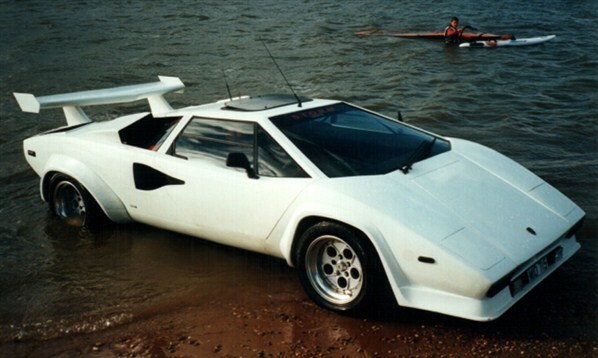 Why would anybody modify a Lamborghini Countach to be as adept in water as it is on tar? 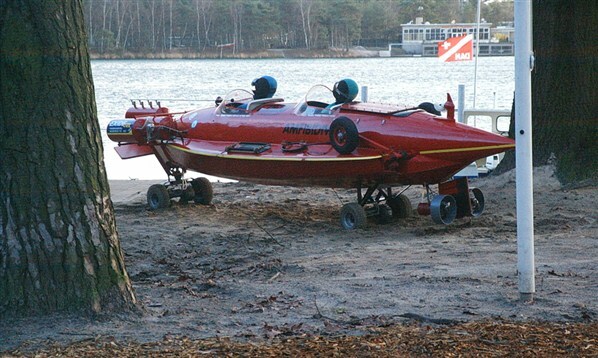 Regardless of the reasoning, this one-off project by UK-based SeaRoader is a fascinating amphibious experiment that features hydraulic raising wheels, a hydrofoil and power in the wet courtesy of twin propellers. Despite its bulky proportions the Humdinga's 350bhp engine can propel it along waterways at an impressive 40mph and 100mph back on land. 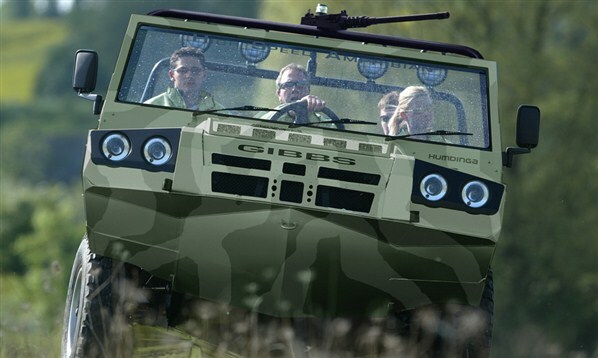 Given its ability to access remote and hostile terrain (largely thanks to its full-time four-wheel drive system) it's not surprising that Gibbs has also developed a dedicated military concept of this model. 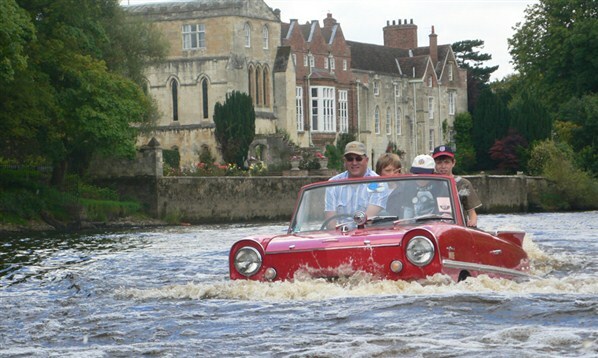 Britain's Tim Dutton has been making kit cars for over 40 years, and fired his first salvo at amphibious cars an impressive 20 years ago. 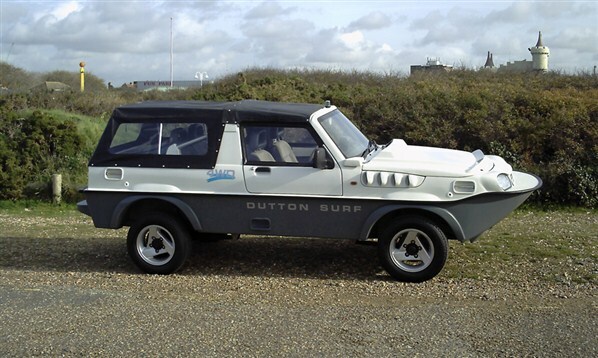 The Dutton Surf is his latest creation and sensibly features four-wheel drive to prevent any embarrassing situations when trying to get out of the water. 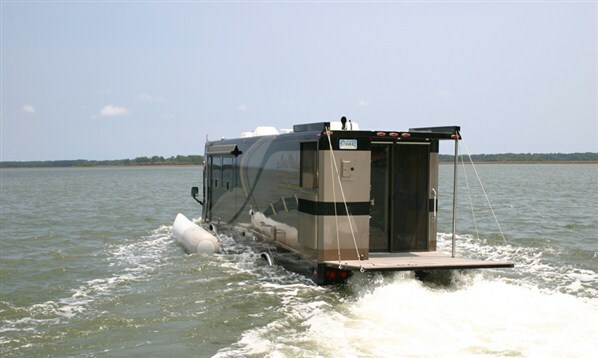 Built from the ground up with the tourist market in sight, the Hydra-Terra makes the bold claim of being completely unsinkable, even with its drain plugs removed, thanks to compartments crammed full of buoyancy foam. 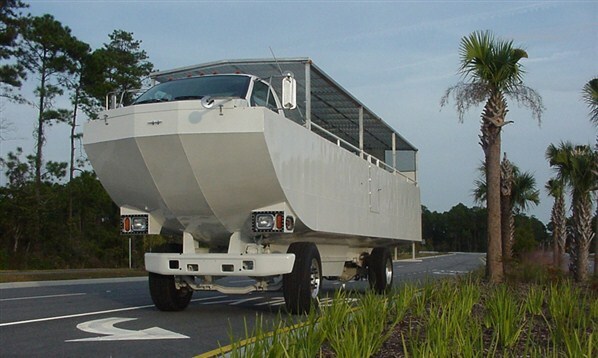 To power its load of 51 passengers, the Hydra-Terra relies on a massive 7.2-litre Caterpillar diesel engine. Where most amphibious cars set out to combine boating and motoring abilities in one model, Belgian's Amfibidiver takes that one step further to create a driveable submarine. Crafted from the fuel tank of an airplane, two bicycles and the hull of a sailing boat and powered by motors from five electric wheelchairs, the Amfibidiver is truly one of a kind. Using the massive Dongfeng EQ2102 carrier as a donor vehicle, which in turn is based on the Nissan Condor lorry, the ChinaDuck is no dinky amphibian - measuring 10m long and weighing in at a chunky 8.3 tonne. 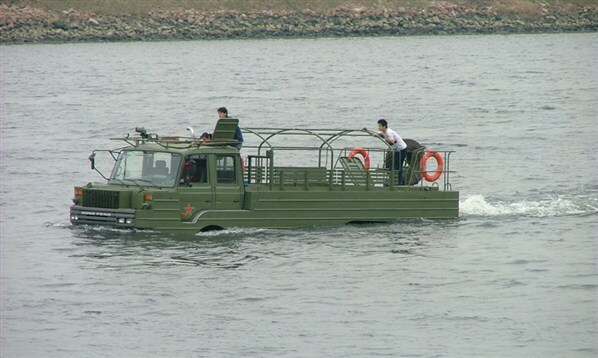 Created specifically with a military application in mind, the ChinaDuck can transport both cargo and troops. 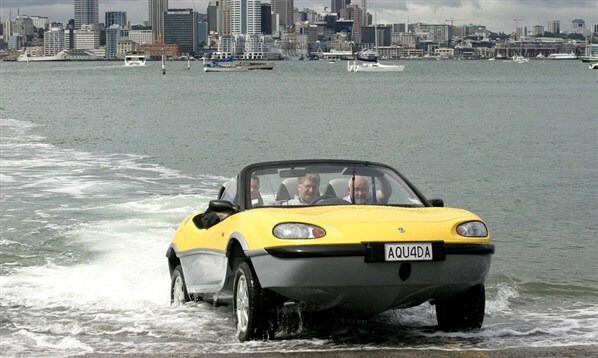 Eternalised by Richard Branson when he set a new record for crossing the Channel in an amphibious vehicle, the Aquada is impressively speedy on both land (100mph) and sea (30mph). 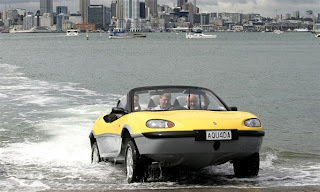 It takes less than 10 seconds for the Aquada to transform from a car to a boat, with the wheels folding in neatly beneath the hull. 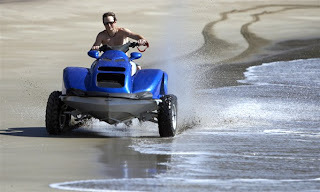 Powered by a mighty 444bhp LS2 powertrain borrowed from the Chevrolet Corvette, the Hydra Spyder is no slowpoke on either the turf or in the surf. Special flotation foam ensures it is unsinkable while a four point air ride suspension system safely retracts its wheels when launching. 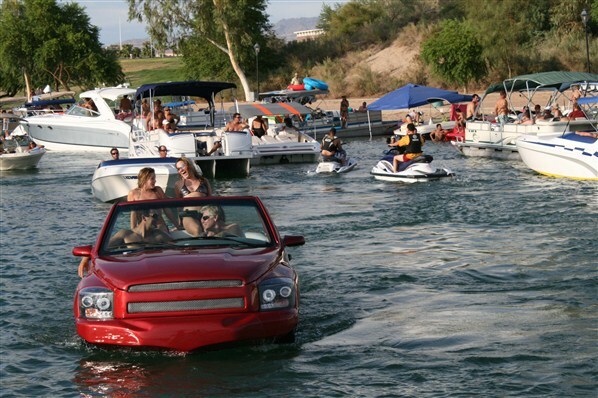 With prices starting at £112,000 your wallet might well require some extra flotation foam. Dreamt up by the same people as the speedy Aquada, the Quadski prototype is a thrilling combination of an ATV and personal watercraft able to tear along the beach one moment and crash through the waves the next. 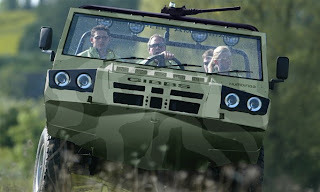 There is also a more serious side to the Quadski when used by emergency services and aid workers, helping them get to otherwise inaccessible locations. Billed as the fastest amphibious car in the world - managing a very impressive 60mph in the wet - the Python is one seriously fun piece of machinery. 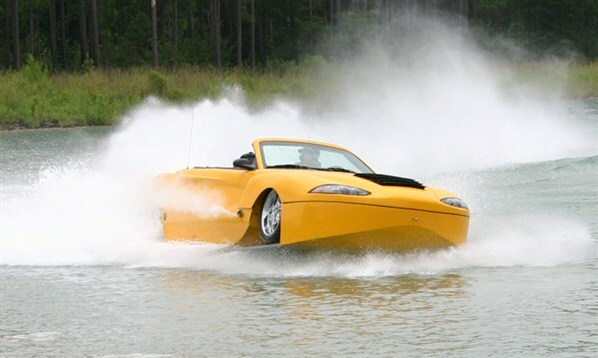 Power comes courtesy of an aluminium V8 mill borrowed from Corvette, and is good for ripping from zero to 62mph on land in 4.5 seconds with a 125mph top speed. 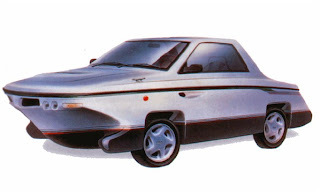 One of several attempts by established car manufacturers to combine the best of two worlds through an amphibian model, the Nagisa never made it beyond concept stage. First shown in 1991, its styling is surprisingly sleek and elegant. 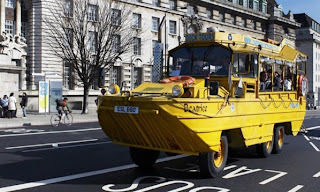 Originally designed in partnership with General Motors for military use during the second world war, many six-wheeled DUKW trucks have now been converted for a fresh lease of civilian life as tourist transporters. 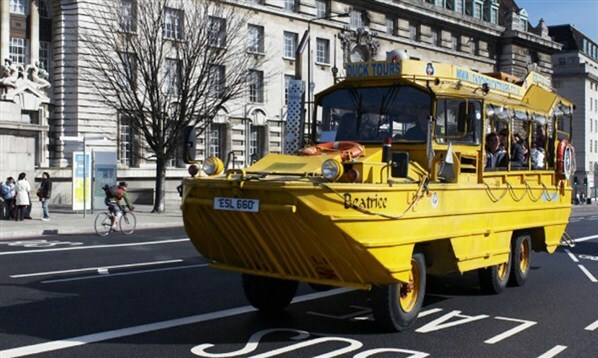 After a jaunt through London's streets, companies like London Duck Tours drive straight into the Thames to continue the trip as a river cruise. With the addition of a handy loading bay, the Amphi-Pickup from China-based JMC further bolsters the practical application of amphibious cars. Based on a four-wheel drive Isuzu model, there is however nothing sporty about the Amphi-Pickup, which only manages 70mph on land and a meagre 7.5mph in the water. 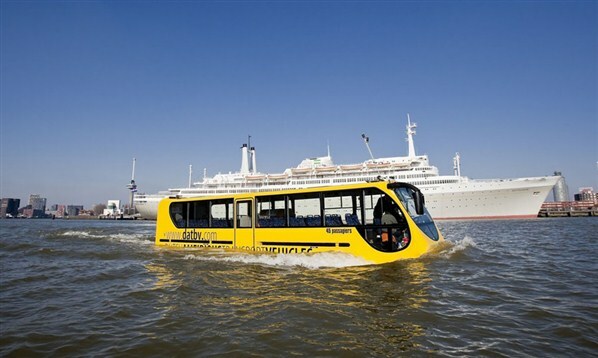 Already popular in the Netherlands as a tourbus not limited to terra firma, the Amfibus was tested in Scotland last year as a possible option for a seamless bus-ferry service. 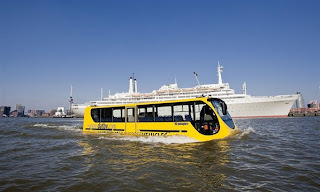 With seating for 50 passengers and capable of 62mph on land and 9mph on water, the Amfibus makes for a clever and versatile public transport option. 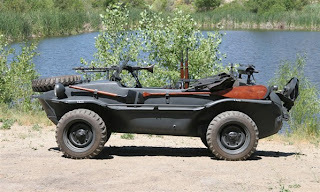 Literally translating to 'swimming car' this amphibious four-wheel drive Volkswagen, originally envisaged by Ferdinand Porsche, was a very popular option with the Deutsche Wehrmacht during the second world war because of its go-anywhere abilities. Based on the Beetle platform, around 15,000 units were built although fewer than 200 of them are around today. 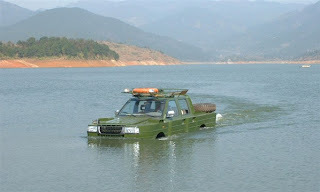 Not all amphibian cars opt for slicing through the water. Like Rinspeed's Splash concept which 'flies' 23 inches above the water at speeds up to 50mph courtesy of a clever hydrofoil system. 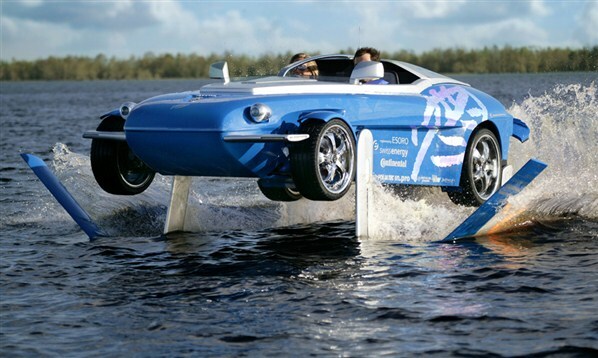 At the push of a button the hydrofoil blade rotates until it is underneath the car, enabling the Splash to completely lift out of the water. 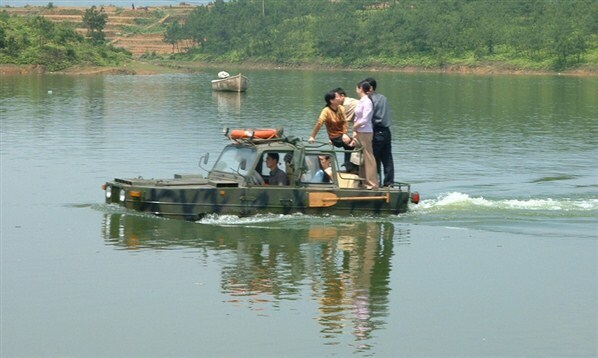 Not content with the legendary off-road capability of Chrysler's Jeep, Baiyun decided to create a Jeep-based amphibious car that won't only climb mountains but could also cross rivers to 'fill the gap in the country's auto industry'. In addition to its obvious military merit, the Amphi-Jeep is also a great option for telecom companies needing to access otherwise unreachable terrain. Noteworthy for being the first mass-produced amphibious car for the civilian market, the 1961 Amphicar sported a 41bhp Triumph Herald engine capable of a very modest 70mph on land and 7mph at sea. Despite its lacklustre performance an impressive 3,878 units were manufactured during its six year production run, making it one of the most successful amphibian cars ever. 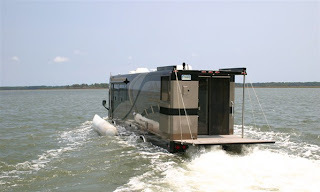 Perfect for buyers unable to decide between a motorhome and houseboat, the Terra Wind deftly combines these two options. Measuring in at a mighty 42ft and pushing the scale to a gargantuan 14 tonnes all that dual-purpose splendour doesn't come cheap mind, with prices kicking off at £550,000.